If you will be staying on Cape Cod this summer for any extended period of time, it is wise to invest in a beach sticker. Although you don't need a sticker to visit most beaches after 4pm or 5pm, that means you will miss the peak hours of the day for splashing and sunbathing. To obtain a beach sticker, call the local Chamber of Commerce or Town Hall in the town where you will be staying and visiting beaches. The different towns have different rates for their stickers. Some towns offer daily and weekly stickers, in addition to seasonal stickers. Some places, such as Nickerson State Park, charge entrance fees and then you can use any of their ponds. The National Seashore beaches have a daily fee, although you can buy a seasonal pass. The stickers can be purchased at fee booths when they are open and at the various vistors centers. 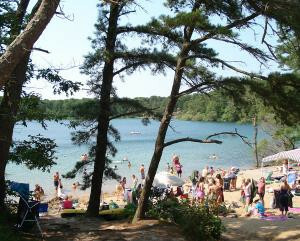 You'll need a beach sticker (or a day pass) to enjoy most Cape Cod ocean and pond beaches. Here Flax Pond at Nickerson State Park in Brewster. Photo by William DeSousa-Mauk.